This may come as a surprise…but in addition to our adventures in bamboo shelters, Eva Nepal still has it’s regular programs going. This week our Gaky’s Light Fellows graduated from 12th grade and from their fellowship. Two years ago, we received 415 applications for the 12 fellowships that we awarded to Nirajan, Anju, Pabitra, Puja, Sandip, Ramesh, Bhagwan, Krishma, Shristhi, Sabina, Narayan, and Asmita. Each of them has an incredible life story, and within the next few weeks, I hope we will be posting a tumblr that profiles each of them as well as the eighteen GL fellows before them. The class of 2015 had a special bond, because it was when they arrived that we established the GL community house. This batch as lived there together and become a true family, and bonded with a handful of wonderful foreign teaching residents who lived with them – Noam and John, Mary, MJ. While most of our past fellows came from Pokhara, this class comes from all over the country. Anju is the first young woman to leave her very conservative community in Janakpur to study higher education in a city sixteen hours away. Nirajan’s home is in remote Dolpa, and he’d been living on his own in Pokhara since he was twelve, performing at the top of his class. Each of our kids’ stories is unique and beautiful. You couldn’t dream them up. These young adults have changed tremendously since they first came together in 2013. At the beginning, basic life skills like arranging a cooking schedule and working out group living issues were new and difficult. Their behavior was segregated heavily by gender. I’ve watched their dress and their mannerisms become urban, confident, progressive. In their weekly Saturday workshops they’ve learned how to use a computer, spell check, do interviews, plan events, speak in front of a group. We’ve taught sections on body language and online image crafting. A number of our fellows have published articles in youth journalism international, including reporting on the morning of the earthquake and on the aftermath shortly thereafter. Last summer, they all did one-month professional internships in sectors ranging from software engineering to child welfare to public health and journalism. 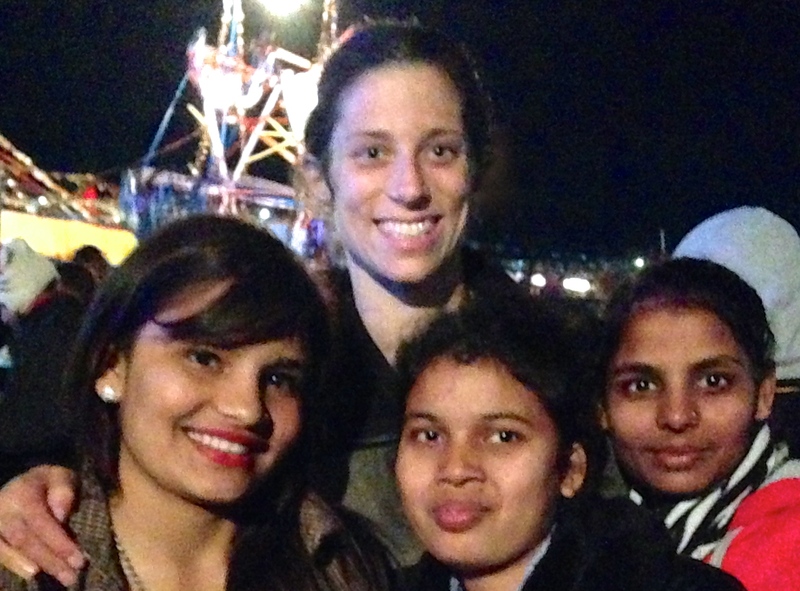 Four of them did their internships in Kathmandu. But I think the thing that had the most significant and lasting impact was the one where we did the least work: the community house. Each birthday was a whole-house affair. The girls wear each other’s clothes. 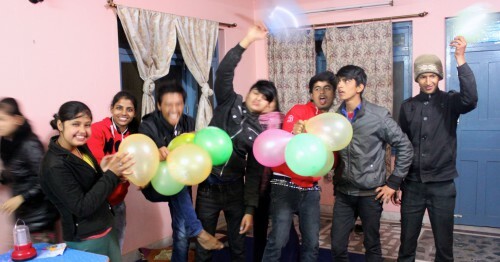 All of the boys staying in Pokhara are moving in together, except for one who got a job in a nearby youth hostel. The peer community they’ve gained from this transformational two years together is obviously going to be a part of their lives forever. With this graduating class, we’re bringing Gaky’s Light to an end, at least for now, so that we can focus on dental care, which is our more scalable program. But boy am I going to miss these kids. I am so proud of them. 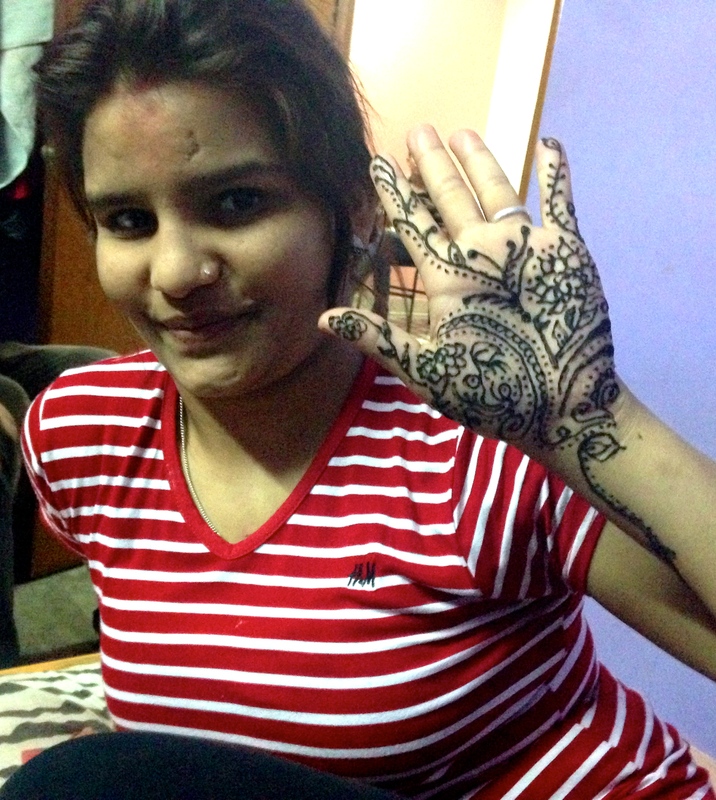 I am going to miss our sleepovers and henna parties. 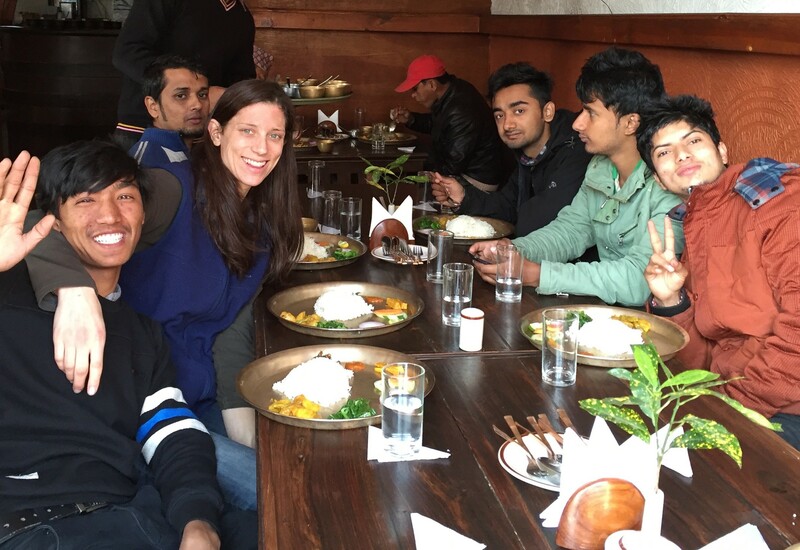 I’m going to miss eating breakfast in Connecticut over chat with them while they eat dinner in Pokhara. At least I know they will be keeping my social media pages full of news (work that online image crafting, kiddoes) and keeping in touch with each other. Their graduation featured lots of speakers: male, female, alumni, parent, me, and our featured speaker, Ramesh Khadka from Right 4 Children, who told his unbelievable life story of growing up on the streets of Kathmandu for ten years and then becoming a very successful social worker with street children. 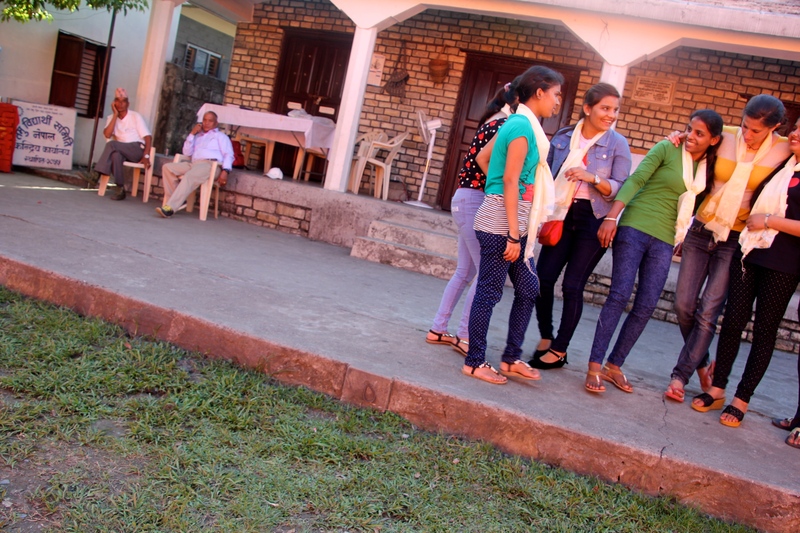 Instead of going for a day-long celebratory outing like last year, we decided to spend the afternoon at a refugee camp in Pokhara that is housing earthquake victims from the ravaged epicenter in western Gorkha. Our fellows bought and served afternoon snacks. The Gurung areas of Gorkha have a unique culture, language, and dress. 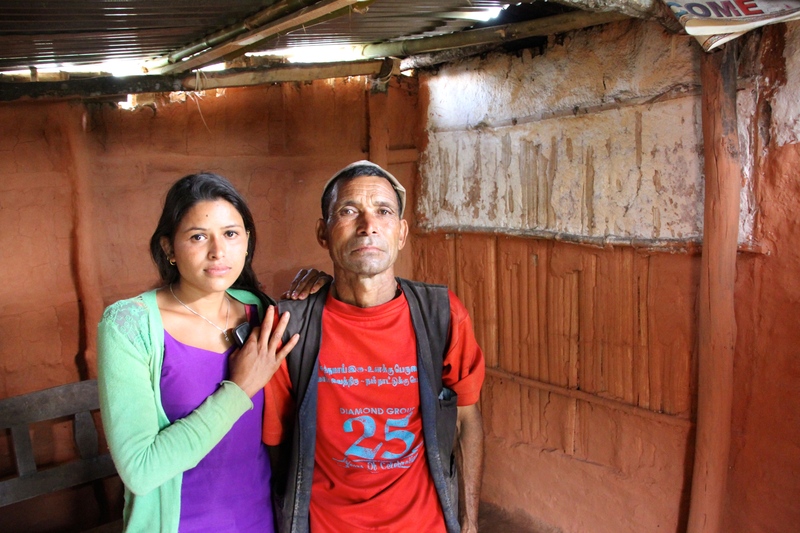 Many of the older people don’t speak Nepali. There were some stunning faces in the crowd. I let the kids and counselors use my camera – I didn’t take all these photos. But I did take this one below, one of my all time favs. The woman in the white shirt kept laughing every time I tried to shout 1-2-3 in their Gurung dialect. Watching her through the viewfinder made me start laughing too. That of course made her laugh harder, which made me laugh harder, and soon this entire group of people couldn’t stop laughing. I love this picture. I woke up after our day in Lamjung feeling all grayed out. I didn’t want to get up so I stayed in bed until 8:45am, which is mid-afternoon here. Everything seemed complicated and shifty. I haven’t even been out to any of the real damage yet and I’m having trouble keeping my spirits up. I went for a run along the lake in the hot sun, showered and sat down in a café with some iced coffee. I took out Manisha’s email from May 1 and reviewed it with everything in mind that I’ve learned now about transitional housing. One thing that’s obvious is that there’s no more time for talking and thinking and researching without acting. We’re going to have to learn as we go. The basics are the basics – don’t impose ill-conceived ideas on people, focus on local resources and let people use their own knowledge to build. Supplement with structural ideas, manpower, and additional raw materials as possible when you know what can be used. Building for thousands of people at once in a short time is a different ballgame than designing the ideal temporary rural house. I looked at how the destroyed and damaged houses are distributed among our working areas and put them in to an order I thought made sense for us to learn by doing. In some, where there are just 2-6 damaged houses, we can try something like earthbag building. In others, were there are 40 or 100 homeless families, we’ll follow the generally accepted plan to provide tin and manpower. We’ll see what happens and improve as we go. I put this all in an email and sent it out to our advisory board. Things felt a little more organized. I needed to confirm that my data from our villages was still correct, because the second earthquake caused more damage, and also other groups may have already provided some materials to some of these places. But Kaski and Parbat, the districts where we are, weren’t hit as hard, so there’s a lot less attention here, even though hundreds of homes are unlivable. There are no big cluster meetings and the government is under very little public pressure to act quickly around here. Once that was all sorted out, I headed to the Gaky’s Light community house. Our Fellows have the first performance of their final project tonight. It’s a tribute to earthquake victims that they’ve been working on with a dance teacher. When I arrived they were practicing and setting up a sound system outside. A crowd was beginning to gather around. As soon as the kids were about to start their performance, the clouds came in, purple and ominous. The rain began but they did their performance anyway, and people watched from under the eaves of shops on either side of the street. One man pulled over on his bicycle, wrapped up in plastic bags from head to toe. He was upset to find out that we weren’t collecting donations, which we weren’t allowed to do in a public space because there’s so much worry about people exploiting the situation to raise funds for dishonest purposes. I decided to have dinner with the kids and sleep at the GL community house. Just as it was getting late, I got a message from Bene and Robin, French friends of mine who live in Pokhara, that there was a meeting the next morning in Sarangkot where they’d be doing presentations about earth bag building. 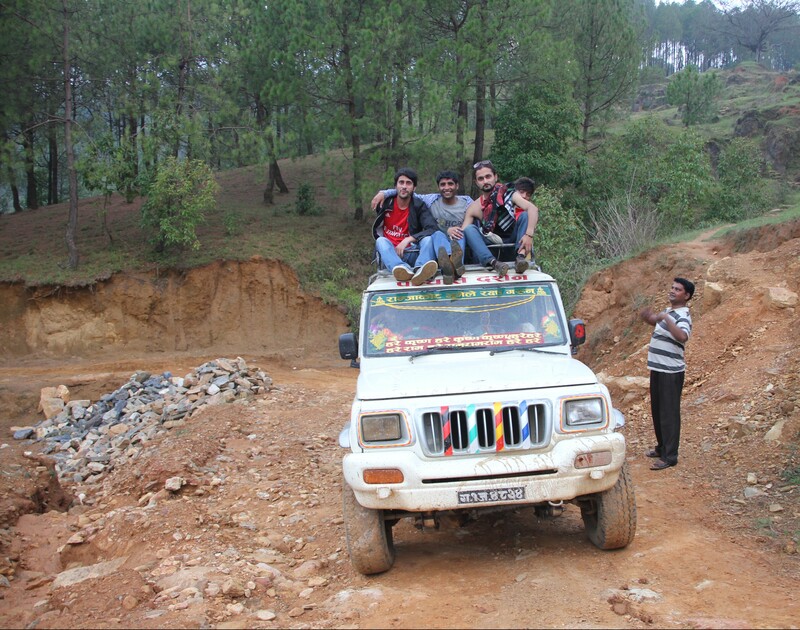 So the next morning I got up and went straight to meet them in this crazy jeep they bought that looks like it was used for transporting goats or ammunition at some point. Robin drives like a bat out of hell, and the road to Sarangkot – the same one I take many times each week to Kaski – isn’t exactly paved with pavement. I’m a pretty hearty passenger, but we were all in the back of the truck bouncing like popcorn, things rolling out the back, I hit my head on the bars a few times, all while trying to shout at the two other guys in the back of the jeep to figure out what we were all doing there. Then I was up at Sarangkot for a few hours with a random collection of foreigners who’d all been doing various forms of freelance aid, learning about how to build houses with earthbags. This beautiful boy in the crowd started dancing during a tribute song written by our fellow Umesh, and kept going for a full five minutes. For the record, I’d left the office at 2pm the prior afternoon, thinking I’d be back in 4 hours after watching a dance performance. I didn’t get back from Sarangkot until late afternoon and went straight to watch the kids do their second performance. A good crowd gathered and lots of people were filming on their phones. But the instant their dance ended, the performance was once again interrupted by rain – this time a thunderous downpour of fat plops of rain and huge chunks of hail. We all ran under a nearby tin roof and waited it out while the sound guy pulled in all his equipment. When the storm ended, most people had gone home. But the kids set up one of the speakers and did the rest of their show – a poem, a few more songs, and a candle lighting. It took all of them at the same time lighting and relighting the wet candles, hovering over them to keep them all going at once, to get the Nepal flag surrounded. And of course a new crowd formed around them. My phone rang and I found out we had a last minute board meeting. I showed up quite wet and bedraggled at 6pm on the back of Shiva’s motorcycle. All my electronics were dead because I had no chargers with me. We ended up sitting there till the place closed, and I finally hopped in a cab and went home. Well that’s kind of how things go here, moving from one universe to another on the backs of bikes and jeeps, following things as they unfold in the moment. I left the office at 2pm on a Tuesday thinking I was coming back for dinner, and didn’t come back until 9:30pm the next day, having been to up to Sarangkot in a jeep and hiked down through the woods for an hour and a half in my flip flops, watched two dance performances, run from hail, spent a night with the kids in the community house, and had a 3 hour board meeting while sipping an americano in a coffee shop under a thinly disguised knockoff Starbucks logo. 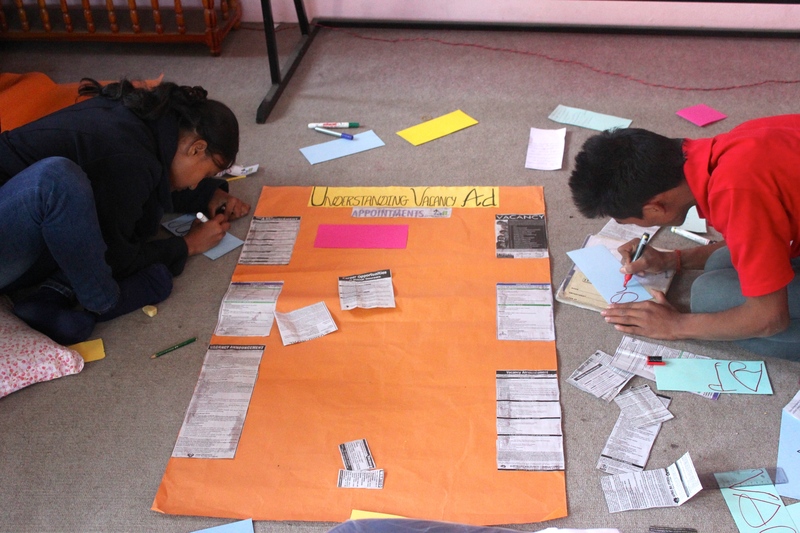 Last week Kaski Oral Health completed this year’s teacher trainings in each of the three villages that launched over the winter. This is where one teacher from each school, who is called an Oral Health Coordinator, learns to conduct a daily brushing program and also do oral health education throughout the school year. 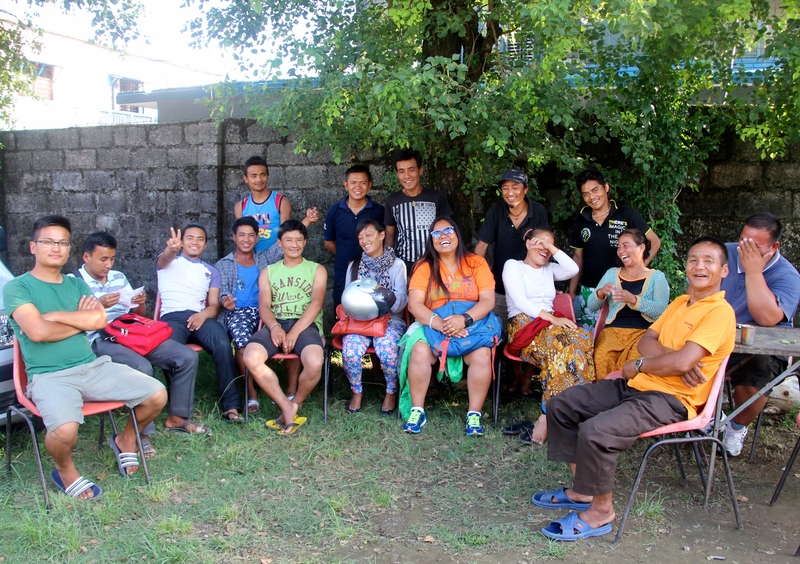 We had to postpone our OHC trainings because the earthquake hit right when they were originally scheduled, and when we did hold them, we had to think about how to keep oral health care relevant in the context that teachers are now facing. There are approximately 129 damaged homes in our working areas, some of which are unlivable, and just outside of a village where we work in Parbat, a nearby area has experienced even more extensive damage and our dental technician has asked us to help. So we’ve made one trip out there, and we’re considering how to approach another. 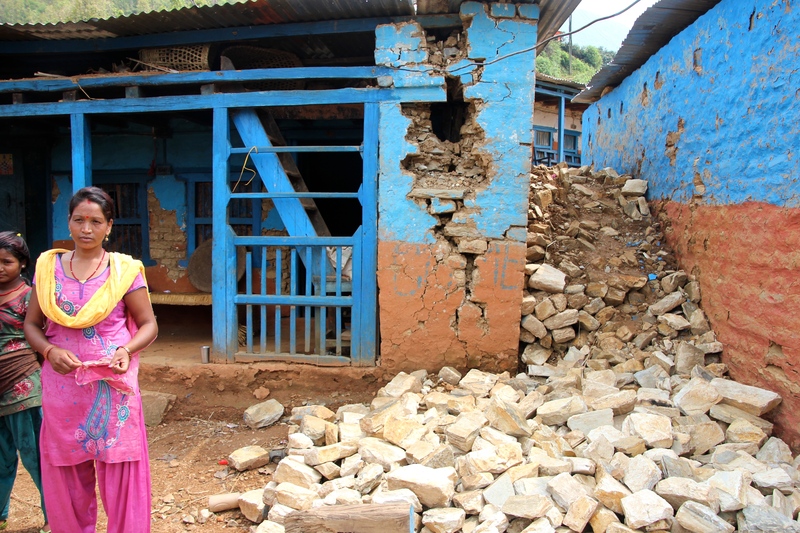 About 13 schools need some or total rebuilding in our 10 villages. All these realities must be acknowledged as we continue trying to advance the work we’ve been doing in oral healthcare over the last eight years. One widespread issue is that shelter aid has been largely limited to people whose houses were totally destroyed. For thousands and thousands of people whose homes are standing but too dangerous to live in, significantly less help has been available – by not receiving tent distribution, for example, and that’s where organizations like ours filled in. Going forward, the government is compensating only $250 per damaged house, compared to the $1000 that will go to families whose houses are flattened. Then again, everybody will need to rebuild from scratch, and even a simple village home costs closer to $3000. All of this is why I want to start pulling back from using our limited relief funds for tents and start focusing on transitional housing that will last people for the length of time needed to rebuild. On a tangential topic, we’ve outgrown our one-room office, and leased a new space that is currently totally empty, which is both exciting and intimidating. So in between scouring the internet and Facebook for examples of tunnel shelters and super-adobe shelters and shelters that reuse tarps, I am also turning over possible arrangements of the sunny new rooms of our office, which have yet to be set up as our home. I took a detour from dreams of shelters and offices yesterday to spend the morning with our field officer, Dilmaya, at Deurali Primary School in Kaskikot. This school is just five minutes from my house, and it is where Didi and Bishnu attended grades 1-5. I have known the teachers there for twelve years. 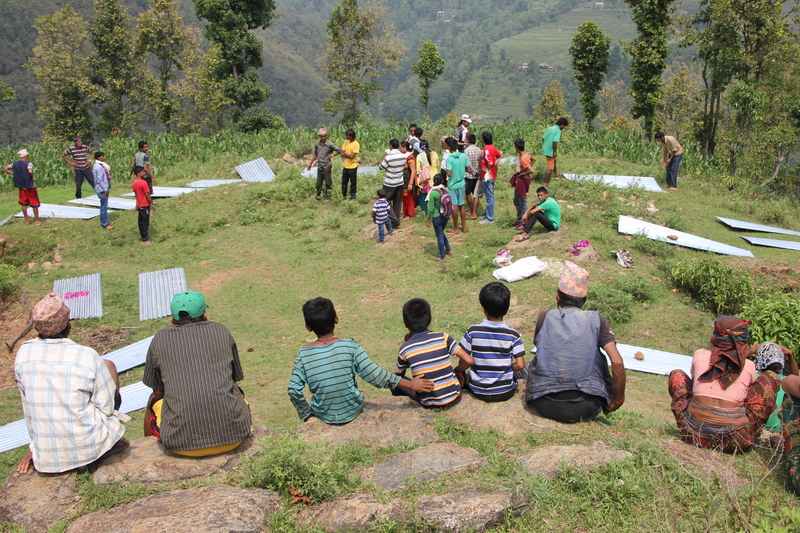 For about 4-5 years, Deurali school ran a daily brushing program we’d helped them start, but it eventually petered out. Their Oral Health Coordinator, a really sweet young woman named Chandra, had asked me last winter to help them restart it. So Dilmaya came up to Kaskikot with her backpack full of brushes and paste, had lunch with me and Aamaa at home, and then we went to Deurali school and sat down with all the teachers in the office. Govinda also joined us – he is one of the founders of KOHCP and was the team leader in Kaskikot for the six years the program ran there. I was amazed when the headmaster pulled a notebook out of the cabinet. He had kept a log, which started in 2011, of each purchase or donation of brushes and paste, each poetry project or dance performance the school had held to advocate for oral health care. We discussed the school’s plans for future sustainability as our contribution declines next year, a plan we require. The teachers presented each of us with kata scarves, a traditional way to welcome and honor guests. You all may or may not remember that when we tried to hand-over Kaskikot’s KOHCP programs and clinic in 2012, the project collapsed due to personal interests among government officials (a soap opera that, for better or worse, was covered in a 2013 Washington Post story). So it’s a bitter pill I live with that in order to keep this program growing and developing elsewhere, I had to be willing to watch it fail in my home village. And since then, we have since expanded to 7 clinics in 10 other villages that cover an area of about 50,000 people. Nevertheless, sitting in this tiny school in my back yard, which has no more than 35 young students, and seeing the enthusiasm and sincerity of the teachers to restart their brushing program, was just awesome. We were all so happy with each other that it was basically one big appreciation fest. Now that we have field officers, we offered to have Dilmaya come back and run a workshop for the teachers on oral health education, where she can teach the art, math and game activities we do with OHCs now to help them promote oral health care in addition to doing the brushing program. Their teacher took the new brushes and paste and ran the day’s brushing program. So that was a nice little pick-me up. Now, back to Pokhara to look at earthbag building. 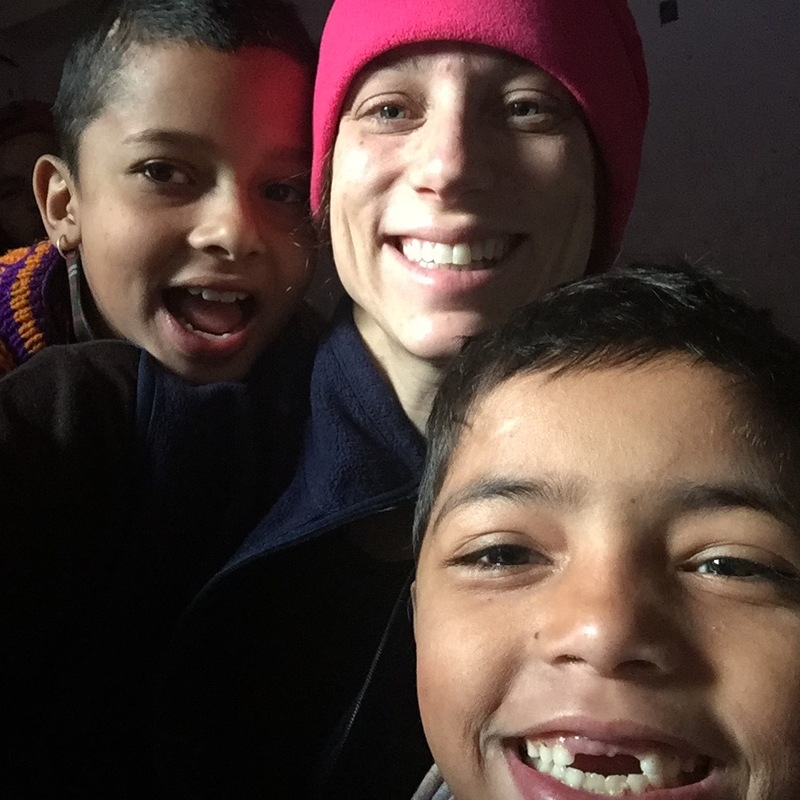 I wanted to provide an update on our progress in Nepal. Each day of the past week has felt like a lifetime, thoughts racing so fast, then slowing down to a halt, then picking up again like a twirl of spinning leaves. Some days just when I’m too sleepy to stay up, someone in Nepal or California or India comes on Skype and we talk till 2am, and then I dream about it and wake up in Hartford. 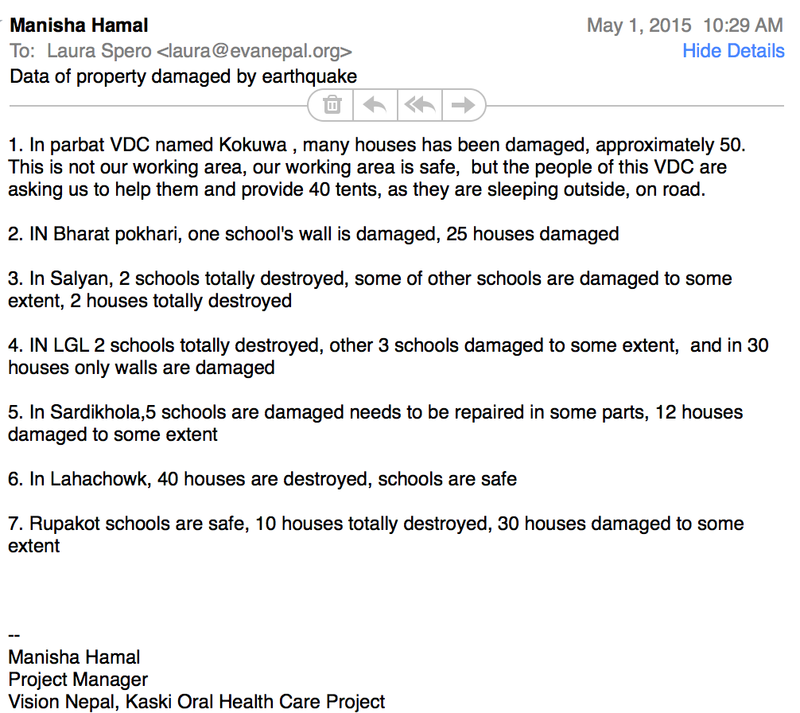 Our Kaski Oral Health Care working areas have sustained property damage to homes and schools, but no human loss of life as far as I know. But we have been able to work with our dental teams (the three locals that run each village clinic) and use our relationships with local governments in these areas to quickly find out what’s going on there and offer help. Earlier this week, thanks to funding from another donor (thank you, GNE)! our board members worked with KOHCP’s dental teams to distribute tents for about 42 families sleeping outside in their respective villages. In the district of Parbat, our dental technician called seeking help for a neighboring village where another 40 families are sleeping outside their destroyed homes. Since I launched our relief fund on monday, it has been amazing – $5200 poured in from people on both continents in less than a week. This morning, we agreed to spend $3500 of it on tents for the 40 homeless families in Parbat. It’s a start. We’ve all agreed that order to get back to our goal of building dental care, we have to do our part to help stabilize the immediate trauma in the places we work. In fact, I’m realizing that with our localized knowledge of these villages, we’re as well set up to do so as anyone is. And that’s been the really incredible lesson of this week: for locally-based organizations like mine, nobody else is coming while we wait. There are just too many places to get to, and the aid that’s available to the people we work with is us. 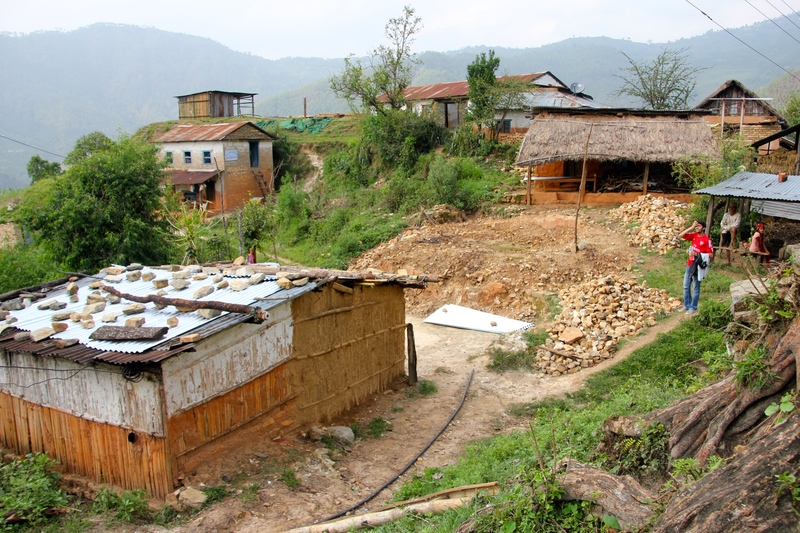 Luckily, Eva Nepal’s working areas did not suffer on nearly the scale of many other places. I’m also talking with friends making trips out to the epicenter in Gorkha, where the devastation is incomprehensible, and all hands are needed. I know this is hard to really believe – by believe I mean, to really picture what this would be like – but some of these remote places have not been reached yet. People have been stranded for a week with injuries and no belongings or shelter or food. So everybody is needed throw in their shoulder the best way they can, or invent a way, and the Red Cross seems to have stepped in to provide coordination, wisely making use of the tremendous energy being delivered by locals. In the upcoming week, I will try to get a better understanding how we can help out there as well. 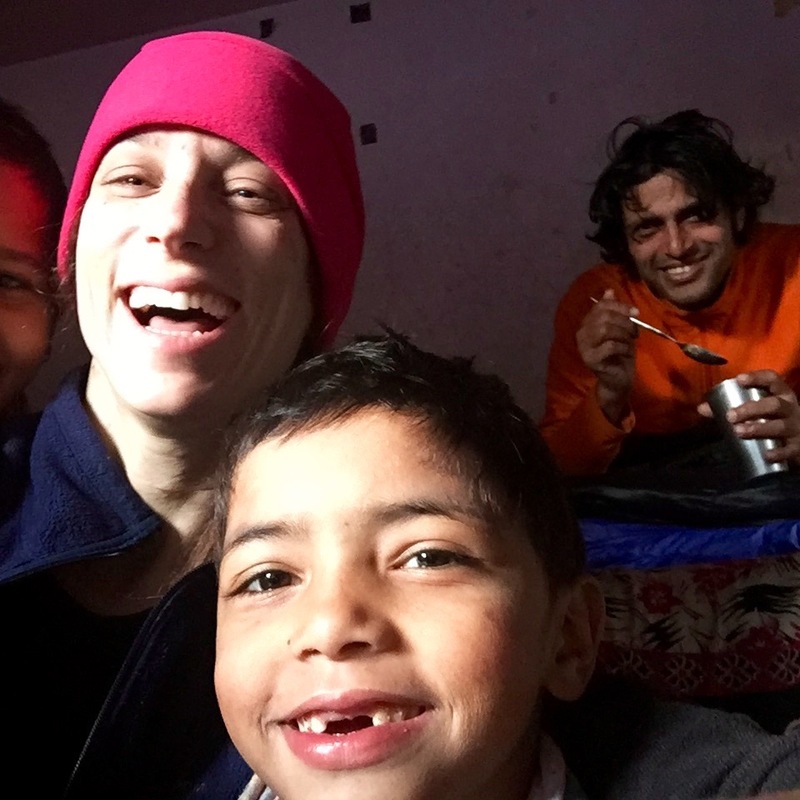 As for me, I have reconnected with a wonderful network of people in this country who also consider Nepal a second home – in many cases researchers who spent years devoted to specific communities or issues on Nepal. People who I met at conferences at some other time, followed generally on Facebook, and are suddenly my go-to clergy for all the pressing questions and worries in my life. We end up chatting late at night on Facebook about the longing to be nearby to help vs. the unhelpfulness of it, sharing articles and tips, asking for contacts and help moving information around. Many of the articles being passed around online are written or commented on by people within this tight, quirky circle of people whose hearts have roots in this country and culture. is this earthquake in america also?? 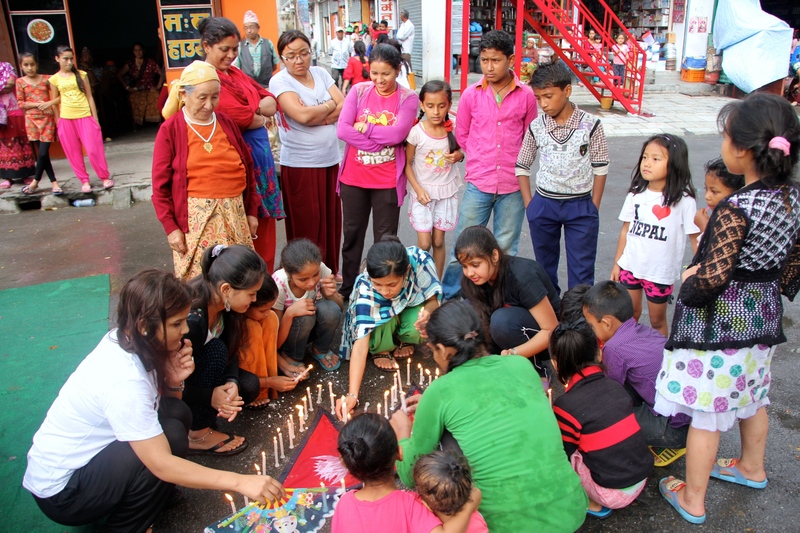 To donate to Eva Nepal’s Earthquake Relief Fund, click here. Didi, Pascal and Aidan and I left for the New Year’s street festival right around dusk. It was already jammed with people and food stalls, a challenge for us because, while Pascal carefully soberly dodges people’s legs and ponders over his food options, Aidan absolutely doesn’t care where he’s going, and he’s only about 3.5 feet tall, and he wants to eat everything he sees, and he can’t take his eyes off anything. We got some ice cream, and some hot dogs, and some cotton candy. At 9pm the Gaky’s Light Fellows showed up with arms locked in a blob. It was such a fantastic moment – they were all dressed up and so excited to be there together, and then they practically mowed me down in the street in a mob of happiness. On the corner a crowd of people was dancing to some impromptu devotional drumming and singing. So that’s how I ended up on New Years spinning around with Aidan on my shoulders and Pascal on my leg and our fellows clinging to my hands while we all danced in the street to a bajan. The street crowd grew so thick that it became river. I left Didi and the boys and waded in with our fellows – we were literally all holding on to each other and being carried down the street by a massive crowd. Every once and a while someone would pick the person right in front of them and, just for fun, shout: “SANDIP IS LOST!” or “SOMEONE HOLD ON TO PABITRA, SHE’S SMALL AND WILL GET LOST!” Samundra, our program director, had a scarf wrapped tightly around his neck. “SAMUNDRA’S NECK IS LOST!” I cried. Eventually, we got lost. There were just too many people, our group was cleaved, and I ended up swimming along with Sabina and Asmita and Anju. All the phone networks were jammed and we couldn’t get through to any of the others. We were finally catapulted through a gate to the fair – I mean washed over the threshold while clutching each others jackets, past a wall of police trying to look for tickets. We came tumbling out next to a ferris wheel like Alice in Wonderland. We dusted our selves off and looked around. It was 10:30pm. There were lights and huge objects everywhere, surreal and dizzying. The four of us stood locked together so we wouldn’t be separated in the hectic sea of people, until we boarded a boat that swings back and forth on a pendulum. We let people in line pass us until we could get a spot all the way at the tip of the boat, where we had the highest view, where all the strange fair lights streak across the sky and the top of the ferris wheel is right there, and you can’t ignore the moment the boat reverses direction and you’re suspended for an instant in mid-air with nothing under you. By this morning, Pokhara looked like the day after the worst frat party you’ve ever seen. Trash, tables askew, dejected looking tents, all kinds of equipment and decorative paraphernalia sagging with a January 1st hangover. Even the sunrise seemed weary. But it was pretty worth it while it was happening. Welcome to 2015, World. Which reminds me of something. When we’d left for the street festival, Aidan had been begging for a new light. Throughout the festival they’ve been selling slingshot lights with wings that sail way up in the air and then slowly float down, so the night was full of beautiful falling blue lights. Pascal, like me, is enthralled with the light but cautious of losing it, and kept his slingshot safe in his pocket most of the time. Aidan on the other hand is completely reckless. He’s too excited about shooting the light up in to the air to worry about what happens to it, and we had rescued his flying toy from more than one rooftop on tuesday night. Each time it got lost he was utterly dejected, and then we’d retrieve it, and he would go right back to catapulting it at the night with unbridled enthusiasm.